The word ‘comfortable’ was used frequently to describe the experience of wearing the Adidas Pure Boost. Its lightweight nature received positive remarks from consumers. The design appealed to runners; for them, it was stylish and modern. Several purchasers noted that this shoe worked well not only for running, but also for gym exercises. The rope-style shoelaces properly helped in securing the foot, some consumers reported. Runners appreciated the general durability of the Adidas Pure Boost’s materials and components. Many users felt that this road-companion was true-to-size. The outsole wore off quickly, according to some of those who have purchased the Adidas Pure Boost. A disgruntled consumer reported that the fabric that connected the upper to the midsole tore apart easily. The folded tongue design caused some discomfort to the skin, according to several runners. They felt as though the portions that were doubled over had hot spots that prevented a well-actuated performance. Many of those who have tried the Adidas Pure Boost proved to be happy with its performance. People appreciated the efficacy of its components, noting that it was comfortable, stylish and true-to-size. The secure upper and responsive midsole were also given praise. There were a few detractors who panned the lifespan of its parts while others lamented its apparently irritating uniquely configured tongue unit. But for the most part, this road running shoe was considered a success. Adidas created this lightweight version of their famous Ultra Boost for city and roadrunners. You won't choose to run in these for lengthy runs, but they are excellent for short runs or getting around town. The incredible comfort and stylish design will make sure you get where you need to go with comfort and style if you can swallow the heavy price tag. Adidas didn't fail with this iteration of Pure Boost. Its simple design allows you to wear it running, to the gym, or use it for casual use. You can slip this shoe on, run around town, and arrive in style. I purchased the all-white variant, and even though I beat the shoe up, it never became that dirty. Now I wash my shoes regularly, but other than yellowing in the Boost material I couldn't find any issues with it. That being said if you run in a muddy environment I would stick to one of the darker colors. The Adidas PureBoost comes with a supportive upper, that doesn't minimize breathability. Although great for long hot runs, running in the rain will not be an enjoyable experience. The Boost material gets wet quickly, and with the lack of an insole, your foot pounds the wet Boost with every stride. Learn from my experience, be home before the rain starts! The tongue on the PureBoost is interesting. Adidas used a “taco” style folding tongue which at first made me worried. Three layers of any material covering your foot from fresh air is a bad idea, right? Well, somehow Adidas made this awkward tongue breathable and somewhat functional. I can’t say the tongue is poorly designed because it works fine, but I don't understand why they had to make it so difficult. There was one spot on the bottom of the tongue where all three layers are sewn together which caused irritation around the toe. PureBoost fit true to size with me. The upper is less stretched than competitors like the UltraBoost, but this shoe has a wider toe box so you should be fine even with wider feet like me. The upper is less stretchy than a PrimeKnit upper, but for a shoe made for the city, it works great. Your foot feels solid and doesn't slip around when making sharp city street corner turns. The mesh style upper covers most of the shoe, except the heel. The inner heel has a very comfortable soft material for a more comfortable fit. A taller pair of socks is almost necessary as the tall heel counter can cause irritation to most runners. Although this is a neutral and minimal shoe, it is still very comfortable while being lightweight. It doesn’t offer as much cushioning as the Ultra Boost we have all come to love, but where it loses on cushioning, it gains in overall contact with the ground. Don’t count on running with these on anything but road surfaces. The thinner boost midsole means that your foot will take a larger impact of all the rocks and uneven terrain you run on. As an under-pronator, I enjoyed the wider Boost midsole in the forefoot. There was a lot of support and cushioning of the lateral side of the foot making it a much more comfortable run. 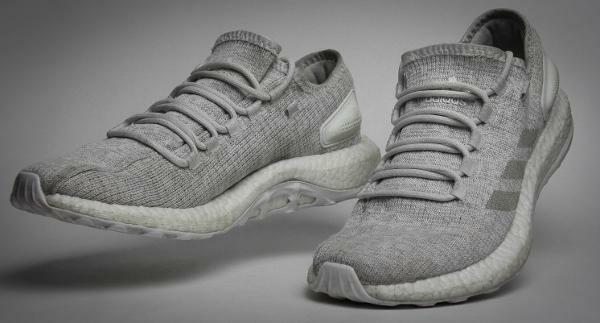 With this iteration of PureBoost, Adidas decided not to include an insole with the shoe. When you put the shoe on, you are stepping on the Boost foam itself. This places your foot closer to the ground, but as mentioned before running on rocks and other debris can cause pain in your foot. What I recommend is going a half size up, if your current size is already tight, and putting in a thin insole. It changes the shoe from being a 10k max recommendation to a half marathon capable shoe. It’s crazy how much a good insole can do! While you're changing the insole, swap the laces too. The ones that come stock are nice and stylish but come untied making them a no-go for performance-based runs. As with most Boost runners, this shoe still offers a great amount of cushioning without sacrificing energy return. The 8mm heel-toe drop allows for a more responsive and neutral performance encouraging you to go fast. If you're looking for a sprinting shoe, look elsewhere. They make this shoe for those mid distances where you need a good balance between responsiveness and comfort. The stretchweb outsole was very flexible. It allowed for a comfortable run with easy transitions. We did not see a return of the Continental rubber outsole on this shoe, but the rubber outsole was a bit thicker than its Continental branded counterpart. The outsole still has plenty of life left after about 100 miles of long recovery runs, tempo runs, and getting around campus. Although not as durable and grippy as its Continental rubber counterpart, the EVA rubber outsole wears well and you can expect to get a few hundred miles of use. I would recommend adding an insole to these shoes. It makes for a more comfortable ride without adding much weight or complexity. The responsiveness is about what you would expect if you have worn a Boost midsole shoe before. Great for running distance, not so great for super fast runs. If you need a versatile shoe, look no further than the Adidas PureBoost. With great cushioning, a responsive run, and impressive looks you can wear this thing for any occasion. Take it on a distance run, run to the coffee shop, or just hit the gym for a few hours. It does it all. Just make sure your back home before it rains! This shoe is probably the most wide foot friendly Adidas shoe on the market. These things look and feel great. Compared with the Adidas Supernova or Ultra Boost, which also have a Boost midsole, the Pure Boost is lighter, less cushioned and aimed at faster road sessions rather than longer training runs. The Adidas Pure Boost is a running shoe that’s built for neutral pronation. The contemporary design follows the trends of today, utilizing a knitted fabric to make up the upper unit. The tongue system is also unique because it’s not separate from the main frame of the shoe; instead, it’s a double-folded part of the main upper fabric, thus emphasizing its one-piece construction. The function of this addition to the global line of road running shoes is to accommodate runners, but it’s also geared towards the casual shoe enthusiasts who want a comfortable underfoot experience in a visually appealing façade. There aren’t a lot of frills in this shoe, so it doesn’t look bulky. Boost is the midsole foam of the Adidas Pure Boost. It carries the foot responsibly and keeps it cushioned throughout the running session. It’s designed to be responsive and flexible. The full-length platform is shielded by a rubber compound. It even extends to the medial mid-foot side of the sole unit to deliver some support to the runner. The Adidas Pure Boost has a standard running shoe length. It comes in sizes that adhere to the regular preferences of people. The available width is medium. It doesn’t have a women’s specific construction as its blueprint has men’s feet in mind. Therefore, the equivalent sizing in the men’s version is applied for female purchasers. Its semi-curved shape of this neutral shoe is designed to welcome the natural outline of the human foot. Similar to the popular Adidas Ultra Boost, the outsole unit of the Adidas Pure Boost makes use of the STRETCHWEB, which is a rubber compound that shields the midsole foam from the abrasive nature of the pavement. It has a contact-pods that are connected by sections of rubber, thus evoking a web-like look. It is also responsible for surface traction. The rubber compound extends to the medial mid-foot part of the midsole. Its purpose is to deliver a bit of support to the underfoot, thus allowing a natural trek through the gait cycle. The underfoot platform of the Adidas Pure Boost is made up of the Boost technology. This full-length foam is actually made up of thousands of cushioning pellets that have been molded together into a singular unit. It brings a springy and well-rounded step. The Knit is used for the upper unit of the Adidas Pure Boost. It’s a breathable cloth-like material that aims to keep the foot comfortable and well-ventilated. A sock-like interior construction is employed in this model. The smooth inner frame allows runners to wear this shoe without socks as it prevents skin irritation. The tongue is made up of the same Knit material. It’s actually just a part of the main upper, only double-folded to give the impression of a shoe-tongue. Circular laces adjust the fit to the preference of the wearer. External heel counters are stitched onto the medial and lateral sides of the shoe. These add-ons hold the rear of the foot, keeping it in place and preventing it from exiting the foot-chamber unexpectedly. The Adidas Pure Boost didn’t have humble beginnings. From the get-go, it was considered one of the connective tissues that linked athletic running footwear to lifestyle attire. But it wasn’t the first running shoe to completely accommodate the now-immortalized boost™ technology. That distinction rests on the 2013 model, the Energy Boost, which used a slab of the amalgamated TPU pellets but didn’t let it fill the entire platform. A year of prototyping and testing allowed Adidas to take a leap of faith and use a full-length boost™ platform to grace the next running shoe. 2014 was a landmark year for the shoe industry as it was the birth year for the Pure Boost, signaling a start of a new era of hybrid running shoes (part running-focused, part fashion-friendly). So what makes the Pure Boost series a boon in the market? Before the year 2014, many people didn’t flock to the options present by the running category of shoe companies because most of the models had sporty façades and hulking frames that didn’t sit well with any casual attire. But that all changed with the release of the granddaddy Pure Boost in 2014. The Pure Boost was fundamentally a product for athletes, but it’s made through a collaboration between many aspects of the three-stripe brand: the functionality-focused Performance department, the lifestyle-centric Originals branch, and the Y-3 division which aims to seamlessly blend style and performance. The three sectors of Adidas wanted to make a running shoe that would completely welcome the power and potential of the boost™ foam without strictly adhering it to the world of running. They wanted a shoe that anyone can use on any occasion. Then the Adidas Pure Boost was born. The 2014 original was indeed a hybrid of style and athletics. It utilized a soft textile on its upper to provide a smooth in-shoe experience for the consumers. Its overlay system was comprised of fused panels on the forefoot and the sides, as well as a stitch-reinforced eyelet module that snaked across one side of the heel to the other but also reinforcing the instep. Yet the highlight of the offering was the full-length boost™ platform, a feat that took the world by storm. It was lauded by many for offering ever-present cushioning throughout any activity. The technology was also appreciated for being durable and highly responsive to movement. It was here that Adidas found its mojo and eventual expertise for hybrid footwear. The Pure Boost Go offers seemingly minor updates, but if one looks closely, the changes make it a completely different shoe from its OG counterpart. The Go version has a goal of providing super lightweight coverage and a street-ready style that is smoother than the current Pure Boost model. Instead of a stitched-on external counter, this model features a visible fabric lattice to hold the back of the foot in place. Also, instead of little fabric loops for eyelets, this model uses long strands of fabric to keep the crisscrossing shoelaces. Such a design is to prevent material bunching, to shave off any bulk from the silhouette, and to allow the excess length of the laces to be tucked into channels of the long fabric loops. The Clima version of the Adidas Pure Boost looks just like the standard model. It even features the burrito tongue unit, the discrete eyelets, and the stitched-on heel counters that serve as landmark aspects of the OG Pure Boost. However, the thing that differentiates the Clima model is the climacool™ system, a set of specialized yarns that are capable of wicking off moisture. These strands are seamlessly integrated with the rest of the upper unit, permitting a coverage that is free of irritants and odor-causing moisture. Moreover, the silhouette has an open construction to allow air to enter the foot-chamber as quickly as possible. As per the usual, the midsole unit is comprised of a generous helping of boost™ cushioning while the outsole is made up of the flexible yet protective STRETCHWEB rubber. The Pure Boost series isn’t only for the roads. In fact, it is a line of footwear that strives to accommodate many types of consumers and conditions. The Pure Boost All Terrain is an example multi-tiered thoughtfulness in design and construction as it’s optimized for both the roads and the trails. The outsole unit is made using the ATR (all-terrain) design, with a generous helping of STRETCHWEB rubber protecting the midsole from below. The rubber has an aggressive configuration, featuring semi-prominent gripping lugs that are meant for off-road traversals. But the tread-pattern isn’t so uneven as to prevent running on flat surfaces. The ATR distinction ultimately says that the runner is given the capacity to transition between the roads and the trails without worrying about changing shoes. Skechers is a company that values performance and style as fundamental aspects of their products. Many of their running shoes make use of fashion-forward designs while also sporting components that are ready for speed training and race day. The GOrun Ride 7 is a product of such a strategy. It is an update to a long-running series of road shoes meant for both beginners and advanced runners. Its midsole is made of FLIGHT GEN, a lightweight compound that welcomes the natural movement capacity of the wearer’s foot. Also, it has the Midfoot Strike Zone, which means that the platform has more material in the midfoot section to encourage the biomechanically-sound midfoot striking method. The Escalante Racer is Altra Running’s entry into the realm of racing. It has an extremely lightweight build that’s truly meant for shoes that are ready for race day or speed exercises. People have commented that they liked this road companions highly responsive midsole, its interior’s capacity to accommodate the natural shape of the foot and its smooth and breathable upper construction. The zero-drop platform was also lauded as it offered a steady underfoot experience that’s similar to feeling a level ground beneath the foot. The boost™ technology didn’t have a lot of competitors during its reign as the premier cushioning system in the market. It stood unchallenged and compared to most standard compounds that don’t have a lot of oomph. But then Nike released the React foam and its running shoe models, one of which is the now-popular Epic React Flyknit. The technology was made from the desire to provide all aspects of a comfortable underfoot experience: springiness, impact-protection, lightweight support, and long-lasting performance. Many consider the performance of the React foam to be on par (or arguably better) than boost™, stating that it made the Nike Epic React Flyknit model a spitting image of the best that Adidas has to offer. People considered the Floatride Run as a running shoe that is capable of doubling as a casual sneaker or as a training shoe. They welcomed its versatility, especially when it comes to its looks. They also liked that it’s lightweight, flexible and beautifully eye-catching. One aspect that caught the attention of consumers was the Floatride Foam, a full-length cushioning technology that offers responsive performances and lightweight support. It’s touted to have a consistent cell size, which means that it won’t quickly sag or wear off, even after many uses. On the upper are various foot-locking mechanisms that are as visually unique as they mechanically efficient; a heel cradle sits separately from the rest of the façade, offering a seamless coverage of the ankles and Achilles tendon; a cage overlay supports the cradle, linking the lacing system to all areas of the shoe and enabling a customized in-shoe fit.